The purpose of this study is to gain a holistic view of the global anti-aging devices market in terms of various influencing factors, such as recent market trends and technological advancements. The scope of this report constitutes of an in-depth study of the global anti-aging market, including a thorough analysis of the products across different regions. The market has been segmented into ‘device type’, ‘product type’, ‘target area’ and ‘regions’. The ‘devices’ segment consist of both stand-alone and direct-to-consumer devices. The report presents the reader with an opportunity to unlock comprehensive insights with respect to the market and helps in forming well informed strategic decisions. The research uncovers some of the substantial parameters that must be taken into consideration before entering into the market. • What are different types of anti-aging devices available in the market and what are the benefits offered by them? • What are the advantages of non-invasive and minimally-invasive anti-aging devices and what are the different technologies they support? • What are the major market drivers, challenges, and opportunities in the global anti-aging devices market? • What are the leading companies dominating the global anti-aging devices market? • How many types of anti-aging devices available in the market, and which are the companies offering them? • Based on product type, which anti-aging device type is anticipated to witness massive rise in the demand in the forecast period? 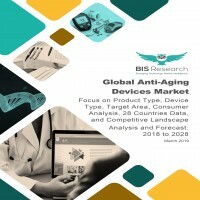 • What are investors’ perceptions about the global anti-aging devices market? • What are the regulations pertaining to the global anti-aging device market? What are initiatives implemented by different government bodies regulating the development and commercialization of anti-aging devices? • What was the market value of the leading segments and sub-segments of the global anti-aging devices market? • How will each segment of the global anti-aging device market grow during the forecast period, and what will be the revenue generated by each of the segments by the end of 2028? • Which region will contribute to the highest sales of the global anti-aging devices market during the forecast period? • What are the leading trends and consumer preferences witnessed in global anti-aging devices markets? The key players who have significant contributions to the global anti-aging devices market include Allergan plc, Cutera Inc., El.En. S.p.A, Koninklijke Philips N.V., L’Oréal S.A., Spectrum Brands Holding, The Procter & Gamble Company, Alma Lasers GmbH, Cynosure, Inc., Home Skinovation Ltd., INMODE, Lumenis Ltd., Merz Aesthetics, Neutrogena, NuFACE, PMD Beauty, Quasar Biotech, Sciton, Inc., Solta Medical, and Tria Beauty Inc., among others. The global anti-aging devices market is further segmented by the geographical regions into North America, Europe, Asia Pacific, Latin-America and Middle-East and Africa. North America is the leading contributor to the global anti-aging devices market with a contribution of almost 40% of the total market share in 2017. However, several emerging countries of Asia-Pacific and Latin America displayed high potential to witness robust growth rate during the period. The global anti-aging devices market is majorly dominated by the U.S. and Chinese players. Based in Dublin (Ireland), Allergan plc offering the “CoolSculpting System” was the leading player of the market in 2017.